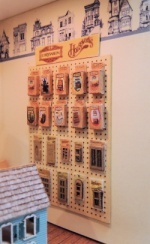 For several years, we produced a series of 1/4 scale shops. I stopped after doing a dozen different little stores, because, frankly, I ran out of ideas. The last year, a favorite customer of mine asked me to do a dollhouse shop in quarter scale. I thought it was a great idea, and this months project is the end result of that suggestion. Just like the previous shops, this one has a hinged front opening, to keep out the dust. It has a darling little building facade, including great signage. And the best part is that you can have YOUR name in the sign. ( up to 7 letters, not including the apostrophe and ending s.) It is lit with led chips that are powered with a coincell battery that is concealed under the flat roof. The roof lifts off for easy access to the on/off switch. 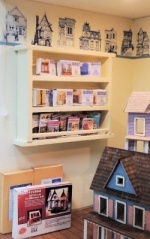 There are five main little dollhouses to make, which are created in a combination of cardstock and wood. If you have made any of my little putz houses, you will be quite familiar with the assembly of these houses... with one exception, these little guys are all open back and even have wallpapered interiors. Additionally, there is a double wall shelf filled with the tiniest 3d printed furniture pieces that you can paint as you wish. Look closely and see if you can find the tiny table lamp on the dresser. Two separate wall units are also filled with merchandise, including a collection of Chrysnbon kits, Houseworks doors and windows (yes, there are really doors in windows in those packages). The second shelf unit contains a collection of House of Miniature kits, and a lovely selection of miniature magazines and books. 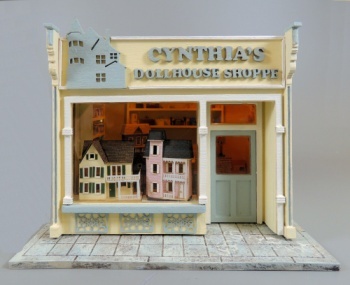 There are boxes of dollhouse kits waiting for purchase, and the owners' antique Bliss house is proudly displayed on the counter. The building measures 4" in height, and the base is 6" wide by 4 1/2" deep. Basic tools will be required, as well as any glues, paints or stains. Materials to create everything you see in the photos is included in the kit, making this a great, all inclusive value. Instructions will be provided in an online tutorial which will provide step by step written instructions and photos. Class size is limited, and registration will close as soon as the class is filled. The estimated ship date for the kits is March 5. Be sure to check out the additional photos below, and please email me if you have any questions.